HA! It wasn't as hard as it looked. Well, the edge, which looked like the easiest part, was actually harder mainly because they were basically the same two parts all the way around. 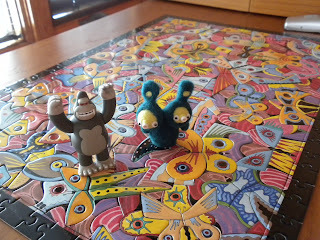 It was a fun puzzle because the pieces don't really interlock, they just sort of fit together. It was still very challenging and I'm glad I had the day off because I wanted to keep working on it.